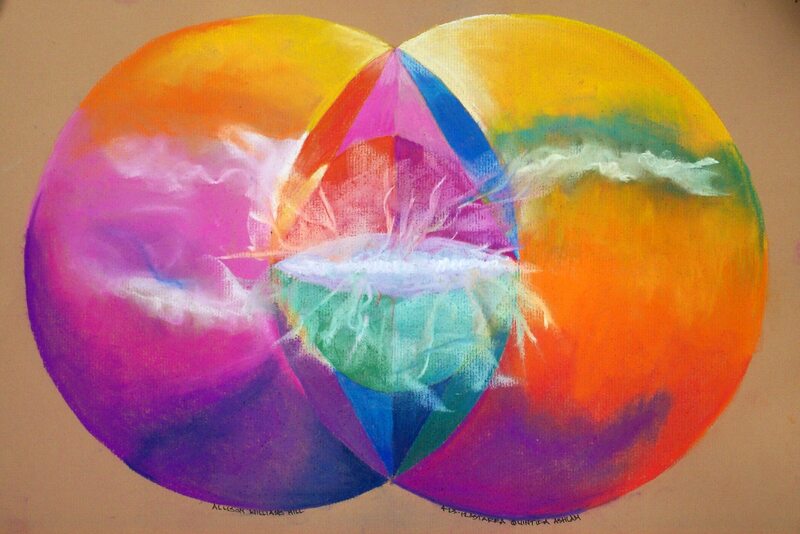 ll L5, now In-Vesica, projects are developed according to the slogan "Architecture is the extension of the human body" which declares our belief in the connection between our state of being and what we exist within. We integrate whole body solutions with state-of-the-art architectural, interior, and environmental design. L5 grew from a traditional architectural design service into a business that acknowledges and incorporates influences that have not, until recently, been considered valid or significant. Besides the limitations of geography; geology; location's climate; the project's program and finances, we address the tangible presence of energy. The collection of these impacts create architectural design projects, interior designs, and environments that "fit" the use and enjoyment of clients. Rehabilitation is one of our specializations. Using existing structures for new applications is a challenging and rewarding process. 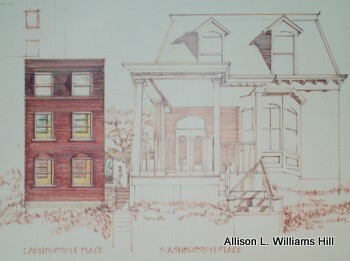 Mrs. William Hill's experience began at two architectural offices in the middle and late 1970s creating Section 8 housing within old law, new old law, and new law structures. We maintain that “Architecture is an extension of the human body” and any sense or ability unavailable to a user can and should be, in some way, present in the structure to accommodate that user. Rehabilitation, in some cases, had been unsuccessful because of existing limitations. 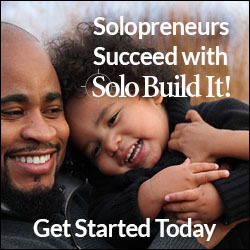 An opportunity may occur where the option to expand laterally is possible. However, where one may have the ability to generate revenue from, for example, a number of rentable units, expanding laterally may result in a decrease of units. The unit mixture is more desirable if there is a variety of tenants that reflects the human community. Other weight-bearing issues include the principle and interest on the construction loan now mortgage and what the target market can afford. 68 Warburton Avenue, Yonkers, New York, was a design of a low income housing project. 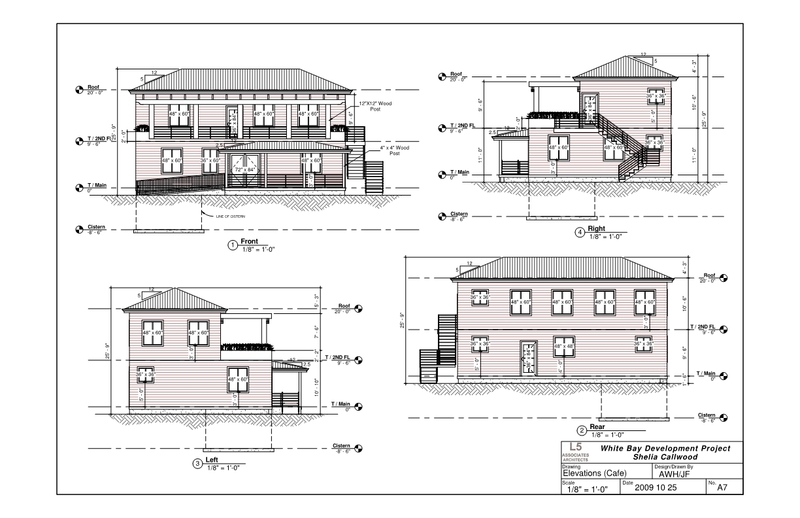 Rehabilitation design services of an existing five story multiple dwelling building for formerly homeless clients with a daycare facility and in-house social service support. Completed in 1993, it was, then, the only Housing and Urban Development (HUD) Part 92 project in New York. The Part 92 - Home Investment Partnerships Program matched private sector funds with funds allocated by HUD for low income and very low income family housing. In some ways, this was a typical multiple dwelling design, however, persons coming in as tenants were on the streets for any number of months or years. The basement level included space for donated clothing, footwear, and other necessities to help the residents start over physically, mentally, and emotionally.The clients were the Zen Buddhist Community of New York, Greyston Builders, Inc.
Universal design; accessible design, barrier-free design refers to architecture and interior design which has developed into an international standard to accommodate the physically challenged. This desire for information and service to a particular community began in 1985. It attempts to accommodate as many limitations as possible even though limitations exist at all levels. L5 Design/L5 Associates held that "architecture is an extension of the human body." 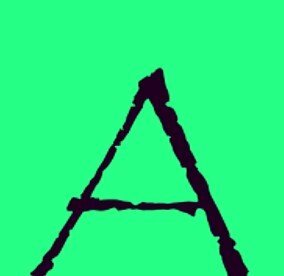 Any sense or ability unavailable to a user can and should be, in some way, present in the structure to accommodate that user. Interior design projects use energy enhancement tools to appreciate the prodigious nature of energy with images, water, light, color, minerals, and flora. The projects below were barrier-free designs. Images will be added at a later date. 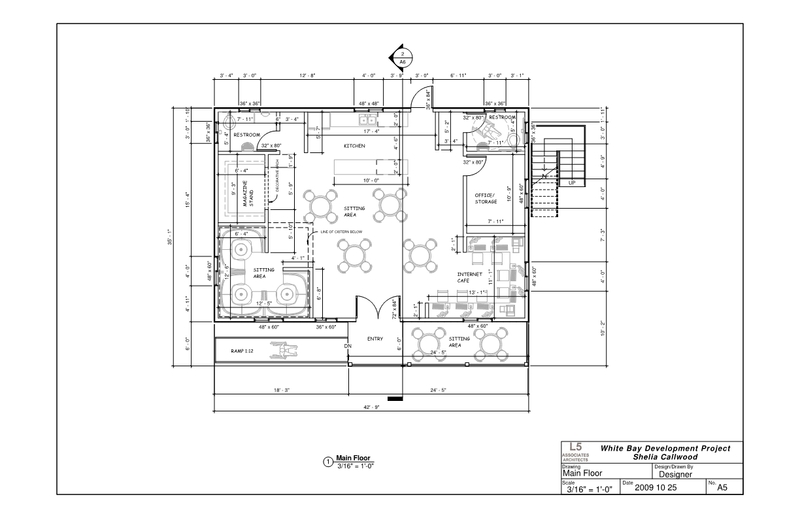 Architectural, interior design and construction supervision of a converted existing one story plus basement structure into an accessible facility with wheelchair lift and interior and exterior ramps. This interior won a 1999 Staten Island Chamber of Commerce Award. Services provided for the relocation of the CPU program into the main International Center for the Disabled, New York building from an off-site location. Created administration and counselors' offices, and meeting room for optimum privacy. Responsible for design development and construction supervision was done in partnership with Sugrue Contracting Corporation, Long Island City, New York. Another project for the International Center for the Disabled, New York. Services included the re-use of a former restaurant space to create offices and a training area for clients with work-related injuries. 3. American with Disabilities Act (ADA)Title III Accessibility Audit and Compliance for existing and proposed projects. People with physical challenges are using more structures with ease now that their needs are designed into the facilities. In 2010, the American with Disabilities Act celebrates 20 years of standards, regulations, the enforcement of accessible design in architecture, interiors, and environmental developments, and the recognition and the inclusion of people who are just as intelligent and maybe not as mobile as what is considered the "norm" or average person. New structures and all type of parks worldwide are reflecting the influence of this community to include as many users as possible. Some existing structures can be retrofitted. However, some cannot be redesigned because of space limitations. In some cases, the increased cost in construction can be offset by the increased customer traffic and the positive revenue projections that will generate as a result. A travel article revealed the billions of disposable dollars physically challenged people possess. The information was an "If you build it, they will come" of approach, mentioning the type of worldwide accommodations available at the time. Senior developments have improved because of accessible standards and have paved the way to understand and accommodate aging adults so that personal freedom can be secured and options for living can continue to remain a choice to remain in their homes. Several years ago, I had the idea of documenting which theaters in New York City could be used by the physically challenged. I am sure someone has created the handbook already. I spoke with several theater owners whose buildings could not accommodate revisions for access, according to an audit. Remember, one only needs to know where to go to get what they want. 1 Ashburton Place was a infill housing design project adjacent to the offices of the Zen Community in Yonkers. 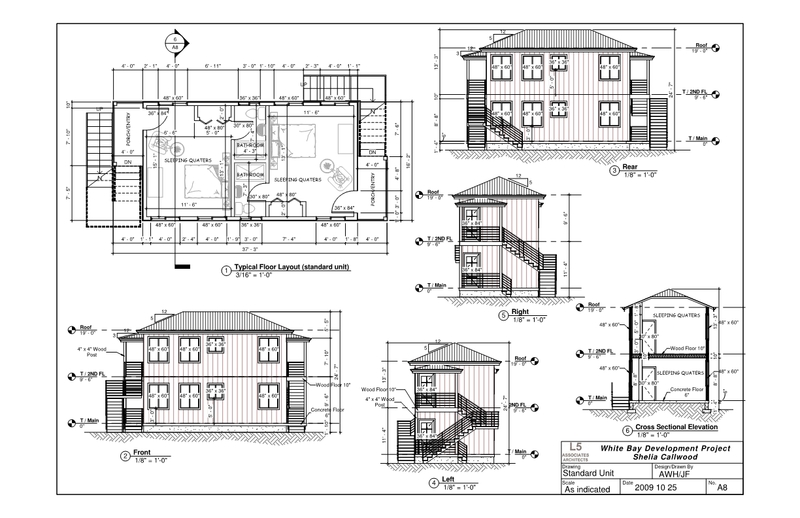 Architectural design services were provided to create an affordable housing structure that was designed to be in keeping with the colors and texture of the adjacent building, not in period detail. Two one-bedroom duplex units on three floors have large eat-in kitchens, floor to ceiling storage and views in three directions. This design has a side yard joined the structures with a communal outdoor living space furnished with seating, partial shade structures, and a garden. This beach resort design is composed of four two story, two bedroom units with second floor terraces oriented towards the Atlantic Ocean. 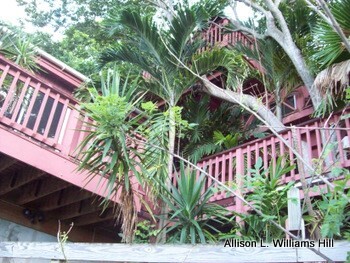 The beachfront property is long and somewhat narrow, resulting in "going up" in the villa design. The geography transitions from sand to soil, and the site is abundant with indigenous trees and other flora that can withstand the salty sea air. 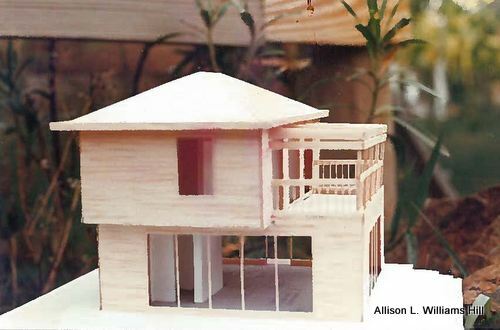 The structure is constructed of Truss Panel (first floor) and tropical hardwood (second floor). A trellis covers the terrace to reduce direct sunlight with passion fruit vines and fragrant flowers. The property, intended to supply guests with indigenous fruits and nuts, has a central pond populated with Japanese carp for beauty and tillapia for consumption. Gray and black water irrigation support the property's jungle-like environment. 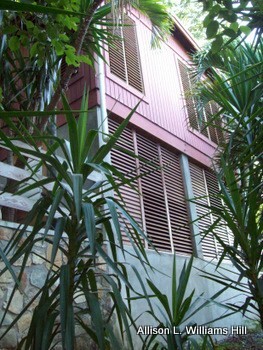 Maximum two storey development at White Bay, Jost Van Dyke accommodates the physically challenged as well. The owner envisioned using vegetables, fruits, and herbs indigenous to the BVI to create as full an experience for the visitor as possible. The café is spacious and is planned as a "hangout" for children after school. 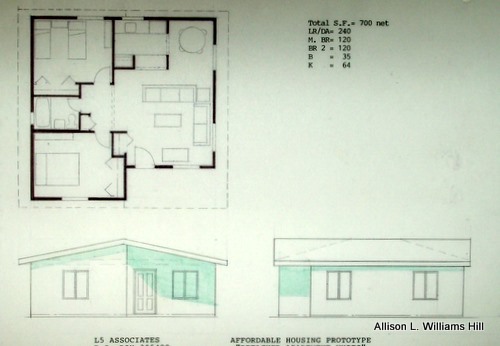 Some of our projects in affordable housing were in response to perceived need in the territory. The British Virgin Islands imports over 90% of its products. Of all construction materials, crushed rock is the only produced item on Tortola. Furthermore, when demand exceeds supply, the two quarries import from Puerto Rico. 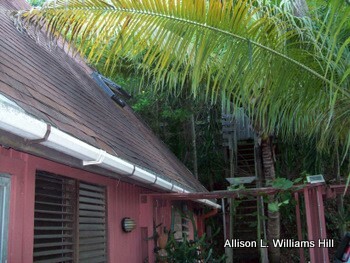 Construction methods were antiquated; little innovation remains in the BVI for a significant period of time. When Dr. Hill was Assistant Secretary for the government, he spoke with representatives from all of the banks. The cost of construction was high, especially for housing which limited a lot of people from owning new homes. 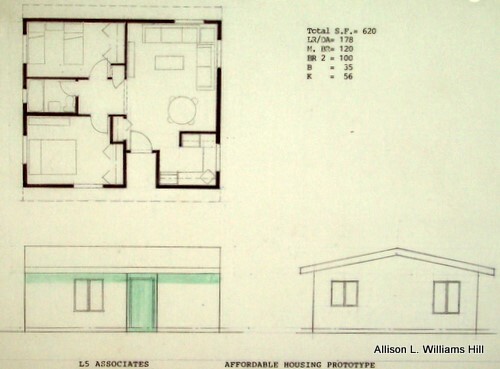 We created small, affordable homes using sustainable design that could accommodate new families, singles, and senior citizens. 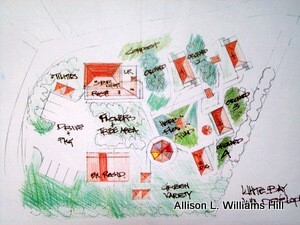 Other spaces could be added to increase the home using open space with covered circulation paths uniting the spaces. Outdoor living spaces are extensions of the structure and located along the paths. Additions, renovations and rehabilitation are about change. The goal of the change might be financial, physical, emotional, or spiritual. 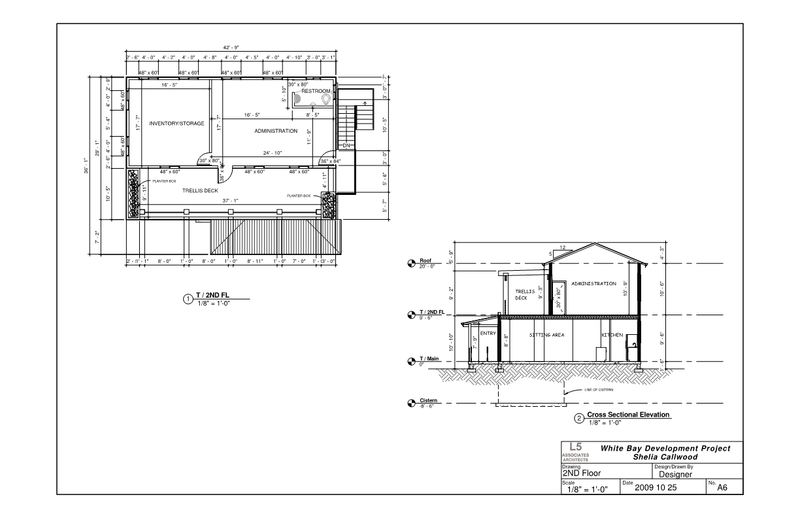 There are several words that are used frequently in architectural and interior design in this web site. One of them is "change." When researching the purchase of an existing home, consider adding additions, doing renovations or rehabilitation for possibilities of changing the envelope. Physically changing the existing structure, adding on or altering in any degree, affords the customer less construction time and earlier occupancy. You can enhance an overlooked asset or highlight an underutilized quality. On the other hand, there may be adequate room sizes but too little light, or spaces appear too confining, or there is less than desirable air circulation. Phased programming separates the tradesmen from the members of the household as much as possible to diminish, if not eliminate, interference. As one lives in the home, one can see during that time what can be added or removed to make a home more enjoyable. Any positive improvement increases the home's value. Home improvement shows may dispute this. However, if it adds to the occupant's enjoyment, it is worth it. Some of these changes can be made without the help of a professional if all of what the change impacts are foreseen and accommodated. For those that require outside help, a seasoned opinion might be a good idea for effects and affects, suitable approaches and materials, and efficiency. Some people comment about how they wish they had a home like someone else. It would be interesting if they thoroughly examined if that home could work for them. Will there be a need for bedrooms for only family or possible visitors? Have they traveled around the world and wish to exhibit their collection in a special room or throughout the home? Rather than limiting a love for plants to pots, would they wish to create planting areas within the home? Is there a desire to hear water fall within the house? Is a style of architecture more attractive than another? Will there be pets? If so, what kind -terrestrial, marine, insects, or birds? Each has its own requirements. Serendipity House is a holiday apartment complex for which we assisted the owners with a permanent unit. prior, they occupied non-rent units, moving about the complex. Creating a unit that they could call their own created serenity, stability, and reduced stress for the couple. A small apartment unit above a new laundry facility and workshop were added to existing vacation villas/apartments. The location of the unit was at the entrance of the site, the meet-and-greet point. The rest of the units surrounded the pool, a short walk away. 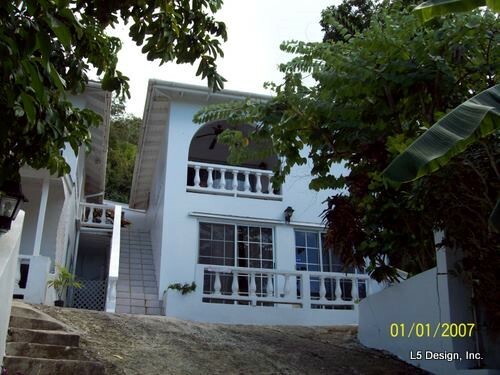 The site is located in Tamarind Estate, Josiah's Bay, resort residential area on the north side of Tortola Island. Tamarind is almost secluded offering complete privacy to vacationers. A beautiful view of Josiah's Bay on the Atlantic Ocean can be seen from the balcony created for dining and lounging. 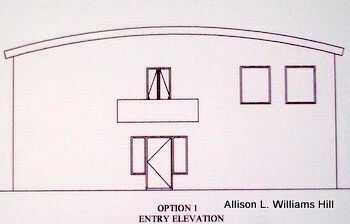 North side of the residence, bungalow, above, Below-the-Bungalow, below. Below-the-Bungalow, the concrete cistern and office are the only parts of this structure that remains after Hurricane Irma, September 6, 2017. This home improvement project grew from 2 levels to 4 to create more interior and exterior space to take advantage of the serenity and beauty of the site. The owner planted more trees successfully concealing the home from view along the main road. The various levels define spatial activity. 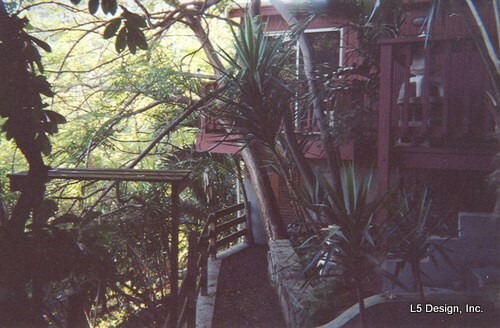 The lower parking level is separated by a small veranda from the areas dedicated to professional use. New work included building a bungalow that has the feel of a self-contained studio. 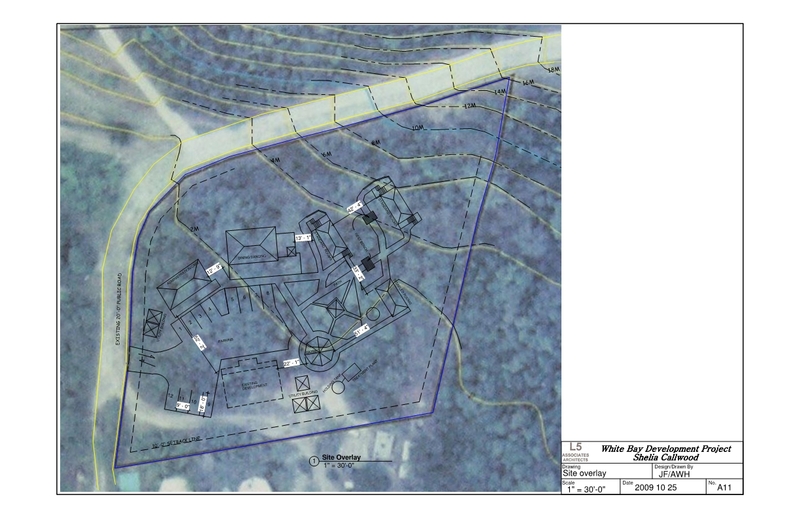 The gazebo at the northernmost end of the property was also the highest point overlooking the roofs below down to Josiah's Bay. The lowest level served as sleeping quarters, exercise, and meditation space. One could access the east and west sides of the parcel through this space. 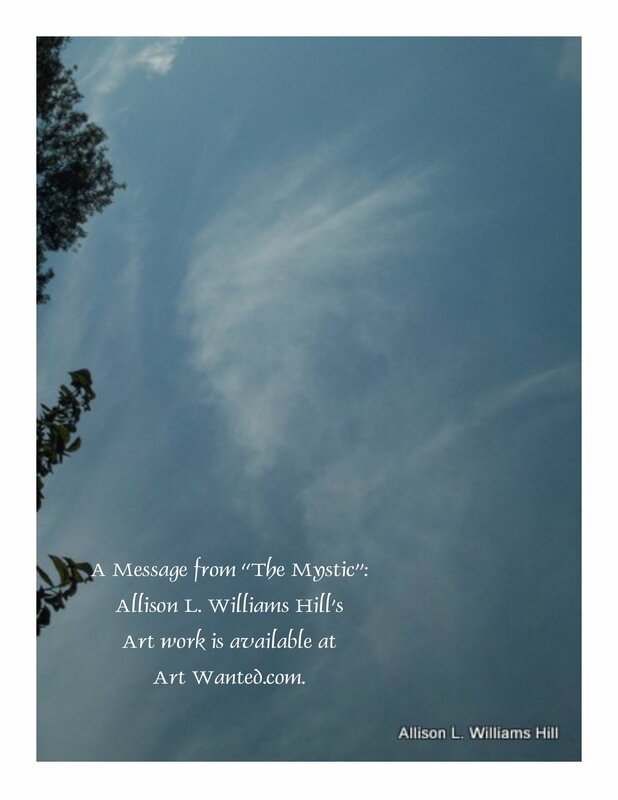 Visitors commented on the peace and serenity they felt when at this site. The above image looks over the bungalow's roof towards Josiah's Bay and beyond to the Atlantic Ocean on the north side of Tortola Island.